Ayer's Encased Postage -- Civil War Stamp Currency by John Gault for J.C. Ayer and Co.
Click on the image of the book cover to BUY or find information on the book published in September 2018 on the 100 year history of the company. 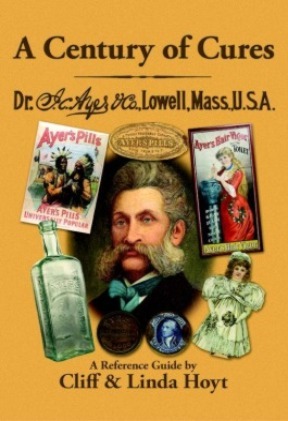 Interested in the history of patent medicine and the medical company of J.C. Ayer & Co. of Lowell, Mass.? Then you will want to read A Century of Cures, the 500 page history of the companies of J.C. Ayer. The book contains over 750 color images of Ayer Company artifacts. This website represents only one chapter of thirteen in this book. In 1862, day-to-day commerce became strained by a shortage of coins. At the time, paper money was not backed by gold or silver. Only faith in the central Government gave the bills any value and the Civil War put significant strain on any faith that had existed. Coins were worth more than their paper equivalent and were subsequently not spent on goods that could be bought with paper. The financial issues resulting from coin hoarding became worse when financiers found they could use paper money to buy silver coins, sell the silver coins to foreign markets for gold, and then buy paper dollars for gold at discount prices. They repeated this process numerous times, making significant profits and helped to create a severe coin shortage. During the middle of 1862, $25 million in coinage disappeared from circulation. By July of 1862, coins were worth 20% more then paper money. To add to the problem of the coin shortage, the lowest denomination of U.S. paper money was the $5 bill. The coin shortage could be life-threatening for a society where one cent bought a newspaper, the average salary was twelve to fifteen dollars a week, and a private in the army earned about thirteen dollars a month. ● Individual states cut their small denomination bills into pieces to make portions of a dollar. ● Business issued promissary notes for change. ● Individuals accepted postage stamps in trade. On July 17, 1862, Congress stepped into the fray and passed a law which stated that postage stamps could pay debts of less than $5 to the government. The public took this to mean that postage stamps could be officially used as currency. The stamps were ill-suited for this task. They were thin (destroyed easily with handling) and the glue on their backs encouraged them to stick to hands, wallets, and anything else with which they came in contact. The mess created by loose stamps quickly deflated the elation generated by the misconception of the new law. People began looking for a way to package the stamps to keep from creating a lump in their pocket. Initially, people kept the stamps in envelops or stuck them on cards. Nevertheless, generally these methods failed to provide a workable solution. It was in this environment of coin and stamp shortages that an entrepreneur name John Gault tried to implement his plan to sell stamps in his patented “postage stamp case” or as stated in Gault’s newspaper ads, “New Metallic Currency.” John Gault initially patented his idea on August 12, 1862. The patent detailed the use of button making equipment to manufacture a postage stamp case. Encased postage, as it is known now, is a sandwich of materials, slightly less then the diameter of a quarter. A piece of brass with a hole cut in it (the frame) followed, by mica, a stamp, a piece of cardboard, and finally, a brass backing. A button making machine pressed these items together, then bent the edges of the brass frame over the edge of the brass back. The two brass covers held the mica, stamp, and cardboard in place. Gault silvered early examples of encased postage cases to make them look closer to real coins. He found the process expensive and the silver coloring wore off quickly with constant handling. He soon stopped putting the silver coating on the encased postage. The brass frame and mica protected the stamp but still allowed the stamp to be visible through the mica. The stamps available from the Post Office are called the 1861 series and came in denominations of 1¢, 3¢, 5¢, 10¢, 12¢, 24¢, 30¢, and 90¢. These stamps were new in 1861 because the Government produced the series to eliminate the value of previous stamps held in the Confederacy. A Note on Catalogue Numbers: Our first Ayer’s Encased Postage were purchased in 1976 and we started cataloging our collection with the advent of the personal computer in the early 1980's. During this time, we received, from a now forgotten source, a three page listing of Encased Postage. This list eventually became to be known to us as the Friedberg encased stamp listing. The listing included a unique catalog number for each encased postage known to the list’s author. This catalog number was in the same basic format as the key we had chosen for our personal catalog. We chose to use Friedberg’s number system for the Encased Postage in our collection. Hence, the following images contain the Friedberg numbering system. We have augmented the numbering when necessary to add examples not identified by Friedberg. Note on Rarity: Fred L. Reed III in his book Civil War Encased Stamps provides an excellent rating system based on extensive research of auction sales and price lists for encased postage sold between 1891 & 1993. The number of encasements in existence for any Ayer example is derived from this rating system. Gault planned to make money two ways: (1) he made the encased postage in a range of popular denominations (mostly 5¢ and 10¢) and then sold them directly to stores or business that needed coins for about 20% above face value of the stamp or (2) he customized the case, putting advertising on the back of the case. Companies paid a two-cent premium above the cost of the stamp for this advertising. At first glance, it could be easily construed that the author of the above article had never seen one of these “medalets”. But with a little interpretation of the now archaic syntax it is easy to see that the author was describing an early silver-coated 3¢ or 30¢ Ayer’s Cathartic Pills encased postage. The reference to “tin” actually refers to the silver coating. Additionally, the reference to “glass” in probably a shortened term for isinglass which is another name for mica. Figure 2 EP-173 30¢ Ayer’s Sarsaparilla. According to Reed’s rarity scale, 2-4 of this encasement exist. Figure 3 EP-182b, 90¢ Medium Ayer’s Sarsaparilla. According to Reed’s rarity scale, 2-4 of this encasement exist. ● eight 10¢ encasements at 12¢ each, etc. Ayer opted for almost the highest penetration of the market available for his dollar. Using statistics, provided in Civil War Encased Stamps by Fred L. Reed III, it is possible to generally estimate that 50% of Ayer’s Encased Postage were 3¢ and 25% were 1¢ varieties. Ayer entered into this arena trying to get the names of his products in front of the highest possible number of individuals with infirmities. 1. "AYER'S SARSAPARILLA TO PURIFY THE BLOOD,” came in three varieties where the name AYER'S was either small, medium or large. Figure 4 EP- 004, 3¢ Small “Ayer’s” Sarsaparilla. According to Reed’s rarity scale, 31-40 of this encasement exist. Figure 5 EP-063, 5¢ Medium “Ayer’s” Sarsaparilla. According to Reed’s rarity scale, 16-20 of this encasement exist. Figure 6 EP-098b, 10¢ Large “Ayer’s” Sarsaparilla. According Reed’s rarity scale, 2-4 of this encasement exist. 2. "THE CURRENCY TO PASS, AYER'S CATHARTIC PILLS,” under the word PILLS there were two arrow heads. Two varieties of this slogan exists: (1) long arrows and (2) short arrows. Figure 7 EP-135b, 12¢ Long Arrows Ayer’s Cathartic Pills The left arrow head has a relatively short shaft while the right arrow head has a longer shaft than the left. According Reed’s to rarity scale, 2-4 of this encasement exist. Figure 8 EP 159b, Short Arrows Ayer’s Cathartic Pills with a 24¢ stamp. The left arrow head has no shaft while the right arrow head has a relatively short shaft. According Reed’s rarity scale, only 1 of these encasement exist. Figure 9 EP-003, 1¢ Take Ayer’s Pills. According to Reed’s rarity scale, 41-50 of this encasement exist. 1. An "X" in the table indicates Ayer's encased postage in the author’s collection and believed to be original. 2. An “R” shows documented examples as determined by Fred L. Reed III in his book Civil War Encased Stamps. 3. An “H” shows documented examples as determined by Michael J. Hodder and Q. David Bowers in The Standard Catalogue of Encased Postage Stamps. Note: The information within the parentheses is part of the rarity scale provided in Reed’s Civil War Encased Stamps. The value indicates how many of each issue are thought to be in the hands of collectors. A. Ribbed Frames – When Gault first produced his encased postage money, he used standard thin brass plates currently used for making buttons. The brass used for the stamp side of the “coin” had thin grooves pressed into the metal. Since the grooves provided no useful purpose, they were eliminated on later issues. These “ribs” are difficult to see without some type of magnification. The groves often show up in photographs as a grainy texture unless the image size is perfectly magnified (see Figure 8 below). A few Ayer’s encased postage stamps have surfaced with ribbed cases. These “ribbed” cases are documented to exist in the 5¢ and 10¢ Take Ayer’s Pills and the 3¢ and 10¢ Medium Ayer’s Sarsaparilla. Figure 10 EP-062, 5¢ Take Ayer’s Pills with a Ribbed Case. According to Reed’s rarity scale, only 1 of these encasements exist. B. Two-Cent Jackson Stamp -- The Government issued the 2-cent Jackson stamp in July of 1863 fully six months after significant production of encased postage and stopped. These are probably fakes. C. Two-Cent Internal Revenue Stamp – The use of stamps as currency authorized by Congress included stamps other than those used for postage. No regular issue encasements contain revenue stamps due to their unavailability during September 1862 and early in 1863. Only one revenue stamp exists and it is in a Take Ayer’s Pills case. One immediate question comes to mind – Why did Ayer not include Cherry Pectoral on encased postage? One could attempt to guess Ayer’s motives. Perhaps Cherry Pectoral, being the oldest and perhaps best-known product did not need the name recognition. Perhaps the Sarsaparilla was still not selling four years after its introduction and needed a boost. Perhaps the Cathartic pills had the best profit margin and reminding the public that purging was healthy helped the financial bottom line. Maybe he just could not miss the opportunity to foist his “Currency to Pass” pun on the public. Whatever the reason, Ayer’s encased postage was not used to advertise either Cherry Pectoral or Ague Cure. As mentioned earlier, 75% of Ayer’s encased postage was in denominations of 1¢ and 3¢. The 5¢ encasements made up 8% of the total while the 10¢ varieties made up 11%. The other stamp denominations of 12¢ , 24¢, 30¢, and 90¢ make up the last 6% of the original 200,000 or about 12,000. According to Reed’s rarity scale, less than 60 of those 12,000 exist today. J.C. Ayer would be astonished to know that someone in the fall of 1862 might have bought a bottle of Ayer’s Sarsaparilla with a dollar’s worth of encased postage stamps that would be worth in excess of $5,000 to $20,000 in early 21st century dollars. It seems obvious from the above article, that the supply of postage stamps for currency had begun to dry up by September 20, 1862. Six days later the Lowell Daily Courier & News provided extensive commentary on a dispatch from the 25th from Washington, D.C. The dispatch states that postage stamps are being diverted from their “legitimate purpose by circulating them in packages together with cancelled stamps as currency.” The dispatch continues by saying that this diversion is embarrassing the Post Office Department because stamps are not available for mail purposes. The commentary states that this dispatch is probably in response to persons in large cities using stamps in place of money. The newspaper does not believe that the Government is worried about the use of a stamp to buy a newspaper. Commentary goes on to say that the post office was kind enough to supply a few extra stamps to ease the pressure of coin scarcity but could not continue this practice to the point of being unable to carry on their primary job of delivering mail. In fact, the Lowell Postmaster has been unable to obtain enough stamps to meet local requirements and now refuses to sell stamps in quantities of more than 25¢. The stamp purge of December 1862 probably had little effect on the circulation of Gault’s “New Metallic Currency.” The one basic characteristic of the stamps being purged from the economic mainstream required the stamp to show evidence of being used for currency and basically unfit for postal usage. Gault’s stamps would not have fit the requirements for purging. In fact, Gault had chosen the term “New Metallic Currency” to specifically distance his product from the disaster associated with postage stamps being used for currency. Gault’s New Metallic Currency (including the Ayer subset) circulated successfully through the middle of 1863 when the Government’s fractional currency (U.S. bills with values less than one dollar) started to become common enough to eliminate the coin shortage. Eventually, the encasements were plundered for the valuable stamps. Today, one can but shudder at the thought of thousands of individuals across the country digging stamps out of the brass cases made for J.C. Ayer and other advertisers by John Gault. The following factors contributed to the short time for encased postage manufacturing. (1) The unavailability of stamps. (2) The “coins” were expensive especially in small denominations (e.g., three cents for a one cent encased postage). If a less expensive solution to the coin shortage was available, companies simply needing coins for change would take the cheaper solution. Cheaper solutions did exist. Private issue Civil War Tokens existed, U.S. postal currency started late in 1862, and in March of 1863, congress passed a bill authorizing “Fractional Currency” paper money. (3) The number of companies willing to buy the coin simply for its advertising value was limited. Only a few were saved as a curiosity, lost in the back of a drawer, dropped in a box of junk, or thrown in a jar full of buttons. Years later, these same outcasts would be rediscovered and collected as part of the Civil War’s numismatic history.